The temple belongs to the Tendai sect. It used to be held on the last day of the first lunar month. It was celebrating that all rituals are finished (kechigan gyooji 結願行事. Farmers prayed for a good harvest and for the health of the silk worms, which were a speciality in this region. kenka matsuri 喧嘩祭り "fighting festivals" . The festival starts in the morning with a fire ceremony, burning goma sticks 大護摩祈祷. After the lunch break, there are concerts and making mochi ricecakes. carrying the mikoshi palanquin and the Shojo float to a "travel rest place" (o tabisho togyo 御旅所渡行 / 渡御行列). 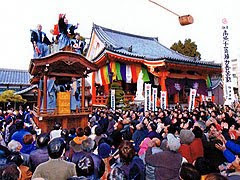 One large float with a shoojoo tripster, standing high with a white fan with a red sun, the Japanese symbol (shoojoo dashi 猩々山車) is the center of attention. The Shojo trickster doll is taken from the float and "thrown around" 猩々投げ in the lucky direction of the year. Everyone fights to get a chip of the doll to carry home for good luck. For a grand finale, mochi are thrown into the crowd 餅投げ and lucky lots are drawn. in our days, the silk worm business does not exist in this area any more. 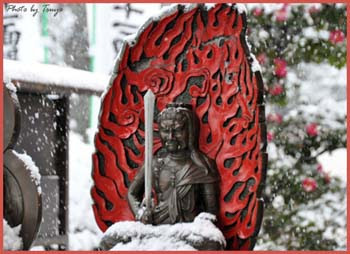 Mie-Ji is famous for its statue of a Kannon bosatsu with eleven heads, made of dry laquer technique (kanshitsu). This temple is number 18 on the pilgrimage to 33 Kannon temples in Mino. sold at the local temple festivals, especially at temple Mie-Ji 美江寺. 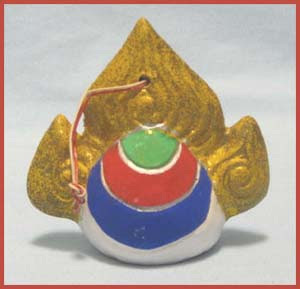 If this clay bell was hung in the room where the silk worms were kept, the mice would not come to eat the worms. Tsuyo san visited there in winter, have a look at the link!